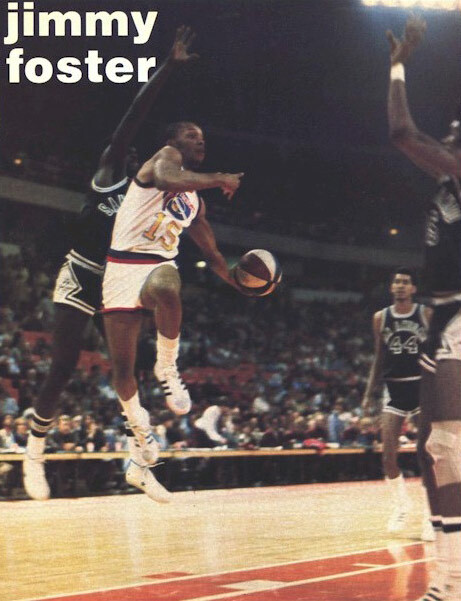 Jim Foster was a Junior College transfer student at UConn and was a great guard. He’s a member of the UConn Basketball All Century Ballot. I spoke to Jim in November of 2003 about his basketball career, which included playing in the National Basketball Association and about his professional career. Jim started playing sports in his childhood neighborhood of Hoboken, New Jersey. Frank Sinatra had also lived there so it was known as Frank Sinatra’s block. Jim played basketball and football in high school and had won awards for both, but going into his senior year of high school it was questionable which sport he was better at and which sport he would play in college. As a senior, during football season he broke his collarbone the first game of the season causing him limited action for the rest of the season. He was left to concentrate on basketball because the injury in football left him without any college football scholarship offers. Jim played well and had a few colleges interested in him for a basketball scholarship but had no offers. When he graduated from high school in 1970, the Vietnam War was going on and he thought he’d be going to war. “My first year there, I averaged 24 points per game. I fooled around a little at academics and had to go to a summer session of school to get my grades up. After that I swore I would never have to go to summer school again. My second year our team led the nation in scoring as a team. I was the third leading scorer in the nation and our team went to the New England Basketball Championship.” Jim made first team All New England and Honorable Mention All American at a Junior College. His team had scrimmaged UConn as well as Holy Cross and Farleigh Dickinson. Schools including UConn were now interested in him as a Junior College Transfer. Jim checked out a few of the schools but he chose UConn because it was close to home and he liked Coach Dee Rowe. “I liked his style. He was a fatherly figure. He never yelled. He was so smooth. He reminded me of Paul Newman, a smooth operator. He taught us how to dress, carry ourselves and speak professionally. He protected us and at the same time cultivated us. He was just one of the best people I have ever met in my life. Dee Rowe was the father of what we have today. He built that program and Coach Calhoun tweaked it.” The UConn program at the time presented a good opportunity for Jim to play. It was a good team, not senior dominated and Jim could be a part of that. A few weeks later Jim was drafted by the Carolina Cougars in the third round of the draft. The Carolina Cougars were an American Basketball Association team. Jim was also drafted by Cleveland in the NBA. He went to the ABA and ended up with the St. Louis Spirits. He was a starter his first year but suffered the same knee injury again and was sidelined. Later, the ABA and the NBA merged and Jim was traded to the Denver Nuggets, which was the thrill of his life. An All Star game was played with the All Stars against the team with the best record. It was the Nuggets. 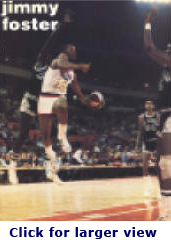 The Nuggets won and the score was 144-139, one of the highest scoring All Star games in ABA history. This game started the All Star Dunk Contest from a dunk that Dr. J did from the free throw line during half time festivities during this game. Jim received an All Star Ring from that game. During the next year, which was his third year playing professionally and the final year of his contract, some of the teams had dissolved from the ABA and there were a lot of trades going on. The teams were looking for size rather than quickness and Jim pretty much sat out his third year. The following year he went to Europe and played in Italy but again the knee injury came back to bother him. Jim moved back to Denver and became a sales person for Volvo car parts, for about eight years. Then in 1984 his dad became very ill with cancer so he moved back to New Jersey. His dad passed away but Jim decided to stay in New Jersey and he’s been there ever since. He’s had various sales jobs from selling computers for Wang until Wang went out of business, when he then worked in the telecommunications business for 10 years with AT&T and MCI. He spent a short time as an account executive for a wholesale company selling internet access to emerging markets and currently he is a lending officer for a financial mortgage bank in New Jersey. In 1990 Jim volunteered as an assistant coach for Saint Peters College in Jersey City, a Division I school. The team won its division and had an National Collegiate Athletic Association bid. They lost in the first round but it was exciting for a small school. After that he coached the freshman team at a local New Jersey high school. He didn’t like it all that much, since the kids weren’t focused like he thought they should be. Jim did graduate from UConn with a bachelor’s degree in Business Administration. He had a paper that was due at the time of his NIT experience. “The NIT games put me on cloud nine that my feet were not on the ground until I was in the ABA.” Jim finished the paper a few years later and received his degree. Jim doesn’t get to Connecticut often but he still checks to see how UConn is doing. Being in New Jersey he hopes the program there, Seton Hall, will pick up but he never wants to see them beat UConn. He said it’s nice to know that your school has won a national championship even though he wasn’t on the team at the time of the win. As for his thoughts about UConn, he said he knows Coach Calhoun does a great job and it seems like they are always a favorite in the Big East. Jim believes that Coach Calhoun has more talent to work with and its self-generated; no one can take the credit away from him.